Don't think I've ever seen coral and rust in the same place before :) I like it! Love what you've created Susan! My husband and i live near a lake too,its across our house ( well, its the Netherlands, water everywhere). 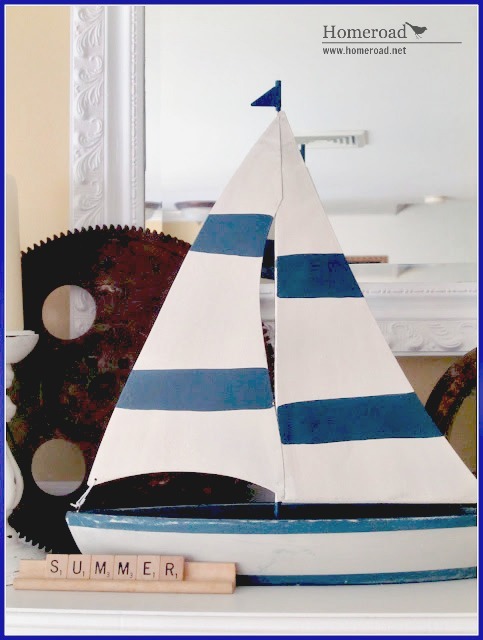 Love the sailboat you made. I want to make a very very small sailboat of a very very small wooden shoe. Still thinking, how to do that. I love your blog and since now i am a follower. Very nice mantel! I love love the old rusty wheel you have. 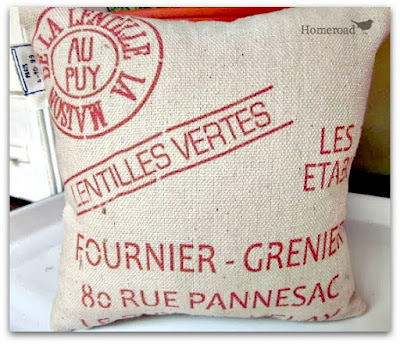 I hunted for ones exactly like this but couldn't find a set so had to antique my own for a coffee table I was making. Here is what I ended up with. Used to said and love your mantel. So refreshing, even in this awful heat. Soothing color combination. Thanks for sharing. Love, love, love everything you have displayed! Wishing I had a mantle right about now! I love all things beachey! Check out my post today about how to make your own blue ball jars. Very cute! Love the scrabble tile. Would not have thought of that. Fun! So pretty! Love the pops of navy especially. so perfect...I just love it! Thanks so much for sharing with Creative Bloggers' Party and Hop, I am co-hosting this week and I am so happy to see you there! SO SUMMERY AND ADORABLE LOVE IT ALL. 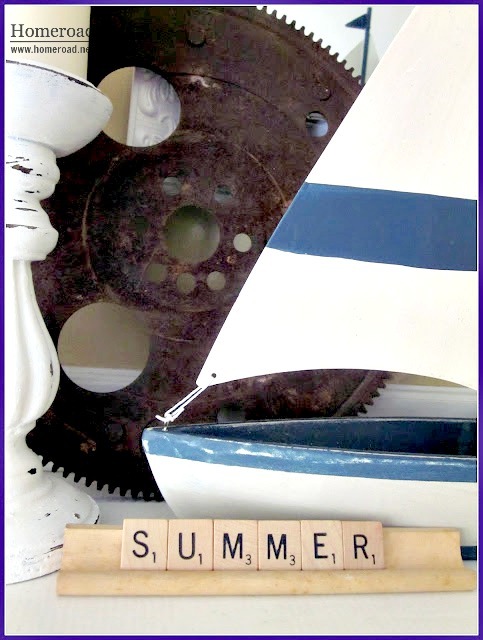 I really love the scrabble summer and the anchor pillow. I love this! Beautiful mantel! That looks beautiful. 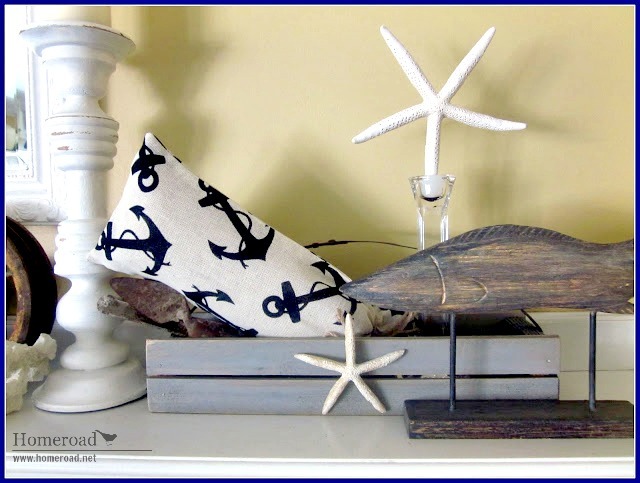 You have inspired me - nautical will be my next mantel theme! 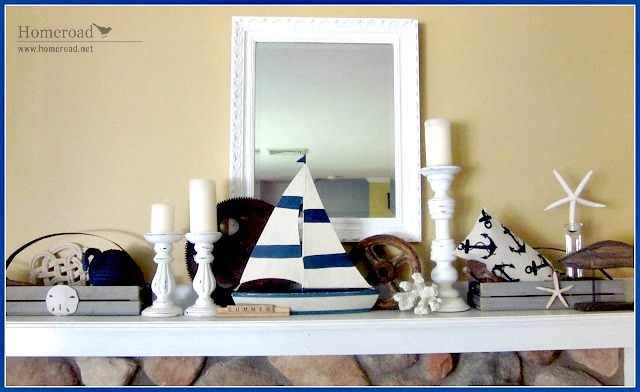 Susan, What a pretty nautical mantel! The scrabble tiles and rusty wheel are wonderful additions. Thank you for joining the Open House party this week. I absolutely love your mantle! 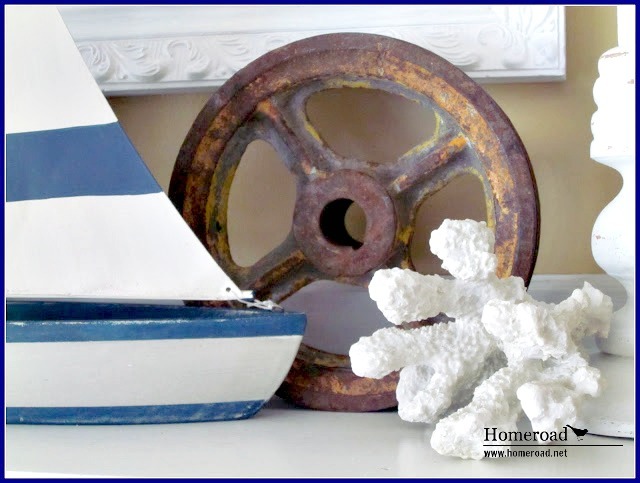 I love the way the rusted gears look next to the coral and sail boat! ahh.....I wish this was my mantle! 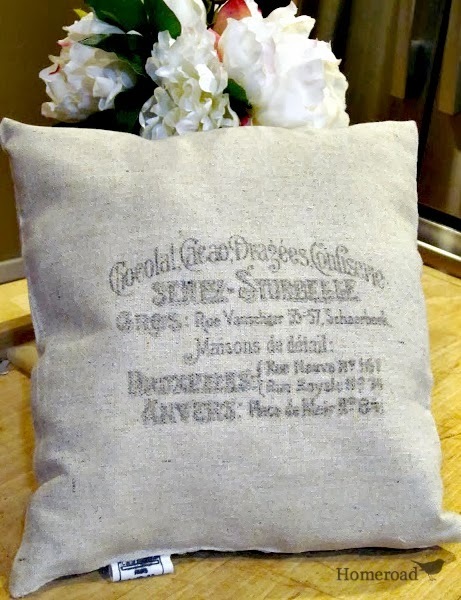 Found you from blue cricket design hop and following! Love it! Seriously; every single element. Gorgeous! Gorgeous! I love the grey boxes and the Scrabble tiles are so cute! If you get a chance, I would love to have you link it up at my linky party, The Creative Spark. It looks fabulous! I love the boat and your use of scrabble letters! So cute! This is fantastic! I found you through Organize and Decorate's link party and I'm totally inspired by it. I would love it if you could link this up to my weekly link party Tutorial Tuesday. Darling mantel and I love the little sailboat. It's all so fresh and summery. 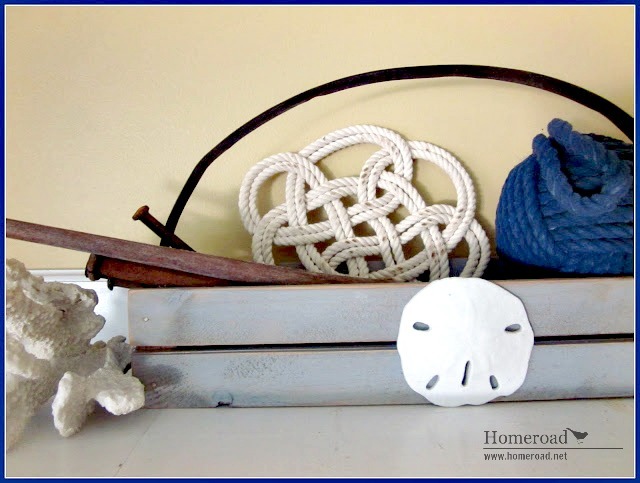 Such a great mantel, the addition of rust is great! This is so pretty! I love the mix of colors and textures! The Scrabble letters are such a fun & unique addition! love the sailboat, where did you it? Very pretty! I love all the special little touches you added and love the nautical theme. Doing my son's bedroom right now with a nautical look. So cute! !